PPM is the package management utility for ActivePerl. It simplifies the task of locating, installing, upgrading and removing Perl packages. The PPM client accesses PPM repositories (collections of packages) on the internet or on a local network. It is also used to update previously installed packages with the latest versions and to remove unused packages from your system. PPM is installed automatically with ActivePerl. To use PPM, your computer must be connected to the internet or have access to a PPM repository on a local hard drive or network share. If you connect to the internet via firewall or proxy, you may need to set the http_proxy environment variable. See PPM, Proxies and Firewalls for more information. 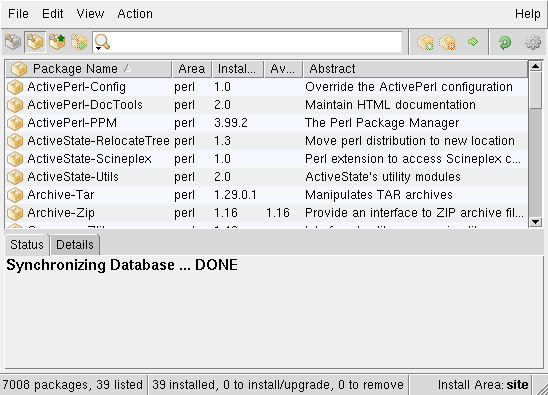 Access to some PPM repositories requires an ActivePerl Business Edition license. When launched, PPM automatically synchronizes its local database with the installed perl packages (including those installed manually or via the CPAN shell). The interface is temporarily locked while this synchronization takes place. All packages: Displays all packages installed locally and available in the repository. Installed packages: Displays all installed packages. Upgradable packages: Displays packages for which an upgrade is available from the repository. Packages to install/remove: Displays packages marked for installation or removal. Mark for install: Marks the selected packages for installation or upgrade. Mark for remove: Marks the selected packages for removal. Refresh all data: Refreshes the list view. PPM Preferences: Opens the PPM Preferences dialog box. Use the Filter text field to limit the packages displayed in the Package List pane to those matching the text entered (case insensitive substring match). Area: Where the package is installed. See install areas below. Installed: Version number of the installed package. Available: Version number of the package in the repository. Abstract: A short description of the package. Author: Name and email address of the package's author. The Status tab displays messages about the current status of the PPM client, marked actions, and information about the actions being run. The Details tab displays package information and, for installed packages, a list of all installed files. All PPM operations and configuration can also be performed at the command line. See the ppm man page or 'ppm help' for more information. As text is entered in the Filter field, the list of packages is automatically updated as the substring match becomes more precise. Click the magnifying glass icon to filter on different meta-data (e.g. Author). Alternatively, just start typing the name of the package. The Package List will highlight the first package that matches the string you have typed. Click on the desired package in the Package List to select it. Right-clicking the selection and choosing Install <package-name> from the context menu. Click the Run marked actions button or select Run Marked Actions (Ctrl-Enter) from the File menu. Click on the Installed package in the Package List to select it. You may want to use the Installed packages button to filter the list. Right-clicking the selection and choosing Remove <package-name> from the context menu. Click on the desired package in the Package List to select it. You may want to use the Upgradable packages button to filter the list. Installation Areas can be selected and Repositories configured by clicking the PPM Preferences button or selecting Preferences from the Edit menu. PPM allows for the addition of new install areas, which is useful for shared ActivePerl installations where the user does not have write permissions for the site and perl areas. New install areas are added by simply setting up new library directories for perl to search, and PPM will set up install areas to match. The easiest way to add library directories for perl is to specify them in the PERL5LIB environment variable, see the perlrun manpage for details. PPM will create etc, bin, html directories as needed when installing packages. If the last segment of the library directory path is lib then the other directories will be created as siblings of the lib directory, otherwise they will be subdirectories. The Repositories tab lists the repositories that PPM is currently configured to use and allows you to add additional ones. Simple PPM repositories are just a directory containing ppm packages. You can create your own by putting packages in an HTTP, FTP directory or a locally accessible mount or filesystem directory. To add a repository fill out the fields in the Add Repository pane and click Add. Name: The name you want to give the new repository. To remove a repository, click the icon next to it. Enabled repositories show the icon; disabled ones show the icon. Click these icons to toggle between states. On systems where ActivePerl is installed in a directory that is not writable by users (i.e. owned by root), a new perl library location can be defined with the PERL5LIB environment variable. PPM will recognize this library as an install area. Launch PPM and click the PPM Preferences button. In the Area tab, select the new install area to make it active. Note: On Mac OS X, user-writable install areas called "ActivePerl" are created for all users during installation (in /Users/<username>/Library/ActivePerl). If you need to install packages on systems without direct access to repositories, you can use PPMX files. These are compressed tarballs containing the PPD file for the package and the blib tree to be installed. You can download PPMX files from http://ppm4.activestate.com/. Note: Access to ActiveState PPMX archives require a Business Edition license. Download the file and/or transfer it to a convenient directory on the target system. Some modules have dependencies that may cause them to fail to install if those packages are not available in a repository that PPM is connected to. You can use the ppm describe command to see what dependencies the package has, but those packages may have their own dependencies. The dependency chain has to be resolved manually by starting with the lowest common prerequisite package. Most modules available via PPM are not owned or maintained by ActiveState; we only pre-package those modules available from CPAN that can be built automatically. Additionally, some packages are not available via PPM because of export restrictions or license incompatibility. Not all PPM packages in the repository are completely up-to-date or available for every platform. Check package availability and build status on the PPM Index site. If a module that you require is not available via PPM, try building it using the CPAN shell as described below. You have to edit the resulting PPD file and add the location of the package archive into <CODEBASE HREF="" />. The location is relative to the PPD file. If you use a proxy server or firewall, you may need to set the http_proxy environment variable in order for PPM to work. Select the Advanced tab, then click the Environment Variables button. Click New in the System variables panel. Add http_proxy with the appropriate proxy information (see examples above). Open the Advanced System Properties tab in the Control Panel (Control Panel > System Properties > Advanced > Environment Variables...). This setting applies to PPM when it is launched from or used at the command line. This setting applies to PPM when it is launched by clicking the PPM icon. a C compiler (not required for 100% pure perl modules). Supported compilers are MicroSoft Visual C/C++ 6.0 and MinGW (gcc). The MinGW and MinGW64 packages are available via PPM for 32-bit and 64-bit Windows systems respectively. Apple's Xcode tool suite is available from the App Store. Linux and Solaris systems will normally have a compiler and a make utility installed by default. See How to install CPAN modules into ActivePerl on the ActiveState blog for more information.